Ohm’s law states that the current through a conductor between two points is directly proportional to the voltage across the two points. The law was named after the German physicist Georg Ohm who published his findings in an 1827 treatise. Although this seminal work in the physics of electricity is considered almost obvious today, this was not the case when the work was first published. Nevertheless, the law, as of today, is considered to be widely proven and is regarded as a paradigm. Collaborative research conducted by Professor Jeehoon Kim from the Department of Physics at Pohang University of Science and Technology et al. has discovered a metal that flouts Ohm’s law when they found that in a particular type of bismuth antimonide crystal, the electrical resistance is not constant but changes with voltage. This achievement has been published in the world-renowned Nature Materials. 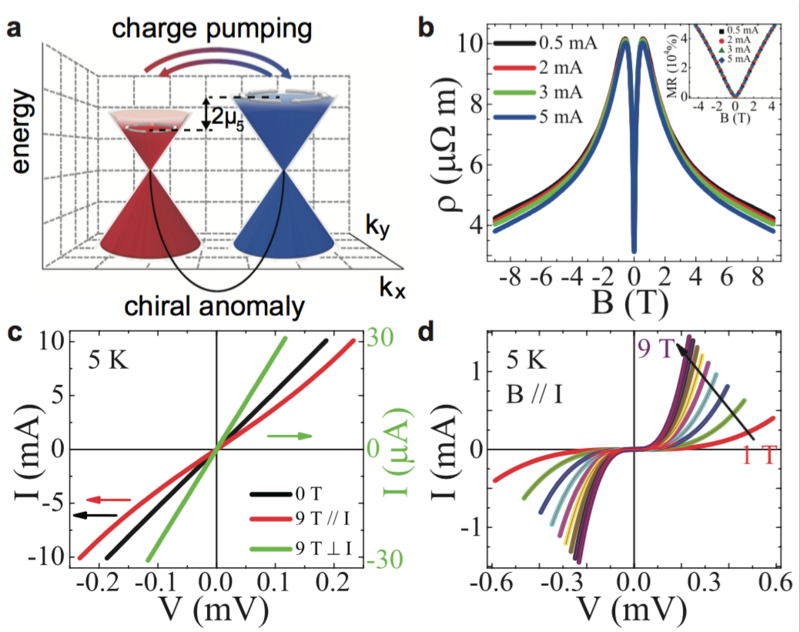 During the team’s research into the Weyl metal phase and its chiral anomaly, they observed the deviation and deduced that the non-ohmic response originated from the non-trivial topological structure of a Weyl metal together with charge pumping—a characteristic of the topological Weyl metal state. In other words, the team found that the non-linear electrical resistance observed was due to a topological idiosyncrasy in the energy levels of electron, the number of which varies with voltage, that allow some of these particles to flow without resistance. Professor Kim commented that “the presence of ohmic and non-ohmic features within a single material provides an important perspective for novel device applications beyond conventional ohmic devices.” Further research into the engineering of nonlinear conductivity is needed, but the Professor notes that this achievement will open a new field of topological nonlinear electronics governed by a topological Fermi-liquid theory.